Marcelo Alberto Bielsa Caldera (locally , nicknamed Loco Bielsa , English: Madman Bielsa; born 21 July 1955) is an Argentine football manager in charge of Lille. Bielsa has managed football clubs and also the national teams of Argentina and Chile. In Chile, he achieved cult status due to the improved results of the national team under his leadership. His personality and gestures during his stint in Chile captured the attention of media and unleashed a series of minor controversies both in sports and politics. On 8 August 2015, Bielsa resigned as Marseille’s coach. In 1980, after retiring from playing in football, Bielsa decided to start a career as a football manager. His first job was coaching the youth divisions of Argentine club Newell’s Old Boys. In 1990, he was given the task of managing Newell’s first team, where he would later go on to win the 1990 Torneo Apertura and the 1990-91 Torneo Integracin, defeating Boca Juniors on penalties. “El Loco” managed the squad that competed in the final of the 1992 Copa Libertadores, losing to So Paulo on penalties. Weeks later, after enduring defeat in the Copa Libertadores final, Bielsa and Newell’s won the 1992 Torneo Clausura. As a child, Bielsa opted to support Newell’s Old Boys instead of neighbors and eternal rivals Rosario Central, the team his father passionately followed. Coming from a family steeped in politics and law, Bielsa decided to break with tradition by dedicating his life to football. His vocation was in stark contrast to that of his older brother Rafael, who as of 2007 is a politician, the national deputy from the Capital District of Buenos Aires; while his sister Mara Eugenia is a former vice-governor of the province of Santa Fe. Marcelo Bielsa played as a defender in Newell’s Old Boys’ First Division Team, but retired early at the age of 25. Bielsa went on to develop his career as coach in that team after qualifying as a physical education teacher. He led Newell’s to several wins in the early 1990s, then moved to Mexico in 1992, briefly coaching Club Atlas and Club Amrica. Bielsa returned to Argentina in 1997 to manage Vlez Srsfield. In 1998, Bielsa was given the job of manager at Spanish La Liga side Espanyol, but he soon left after being offered the management of the Argentina national team later that year, taking over after a four-year period by Daniel Passarella as manager. Argentina won the qualifiers to 2002 FIFA World Cup, but did not progress through the first knockout round at the tournament. Despite this, Bielsa was given a second chance to lead Argentina to major success and stayed on his position. The Albicelestes were runners-up in 2004 Copa Amrica and won the 2004 Olympic Games‘ gold medal. With the latter, his team became the first Latin American team to win the Olympic title in football since 1928, when Uruguay beat Argentina in the final, the first Argentinian Olympic gold medal in 52 years. Bielsa, however, resigned at the end of 2004, replaced by Jos Pkerman. Under Bielsa’s guidance, the Chile national team underwent many positive and negative historic firsts. For the first time in its history, Chile was able to earn a point playing Uruguay away in Montevideo. Chile also suffered their worst defeat ever when playing at home during qualifiers losing 3-0 against Paraguay. This historic low was repeated with a Chile lost of 3-0 against Brazil, which also marked the first home loss against Brazil in a qualification game in nearly 50 years. On 15 October 2008, however, Bielsa masterminded a 1-0 win over his native Argentina, Chile’s first win ever over Argentina in an official match; Argentina’s loss prompted the resignation of its coach Alfio Basile. Chile soundly beat Peru 3-1 in Lima, a location where they had won for the last time in 1985. Bielsa then had Chile win 2-0 at the Defensores del Chaco Stadium against host Paraguay, obtaining an away triumph on this location for the first time after almost 30 years. The team continued the road to the 2010 World Cup with a victory over Bolivia, 4-0. After a 2-2 tie against Venezuela in Santiago, and travelling to Brazil to lose 2-4, Chile finally achieved qualification to the 2010 World Cup after defeating Colombia 4-2, a result that was also Chile’s first ever away win against the Colombians. By helping Chile qualify for a World Cup after two tournament absences, Bielsa attained great popularity in Chile. His appointment brought about visible changes in the Chilean set-up, with the fast-tracking of young talents and a more attacking mindset away from home. Due to the rumors that Bielsa would not continue to lead Chile after finishing their campaign at the World Cup, Chilean fans campaigned for Bielsa to remain as coach of the team in the movement titled “Bielsa is NOT leaving!”. On 2 August 2010, Harold Mayne-Nicholls, president of Chile’s Asociacin Nacional de Ftbol Profesional, announced that Bielsa would remain with the Chile team until 2015. “El Loco“, however, stated that he would leave his position if Jorge Segovia was elected as President of the Chilean Football Board. He followed through on this threat, despite Segovia’s election being annulled, and resigned in February 2011. On 3 October 2011, Bielsa, a devout Roman Catholic, visited the Poor Clares of Guernica, Spain, alongside his wife. He wanted them to pray for his team, which they have done ever since. The signing of Spain under-21 midfielder Ander Herrera was agreed well before the end of the season, although the young star elected to stay with formative club Real Zaragoza as a gesture of respect as they battled against relegation. The players, however, began to adjust to the changes as the season progressed, and following an away victory at local rivals Real Sociedad. Athletic Bilbao produced a good run of Autumn form which included wins over Paris Saint-Germain, Osasuna and Sevilla, as well as credible draws with Valencia and Barcelona, then only to drop points at home to newly promoted Granada. The team also finished top of their UEFA Europa League group and defeated Lokomotiv Moscow in the last 32. Athletic then drew Manchester United and in impressive style won 3-2 in the first leg at Old Trafford, going on to knock them out of the tournament with a 2-1 victory at home. In the quarter-final, they went to Schalke 04 and won the first leg 4-2, despite being 2-1 down after a Ral brace on 72 minutes. Athletic drew the second leg against Schalke 2-2, going through to the semi-finals with a favourable aggregate score of 6-4 to face Sporting Clube de Portugal. After Athletic lost the first leg of the semi-final 2-1 in Lisbon, they overturned this result in the return leg and ran out 4-3 winners on aggregate when Fernando Llorente scored the winner in the 88th minute. This set up a match with Atltico Madrid in an all-Spanish Europa League final. Athletic, however, would lose 3-0 in the final, played on 9 May at the Arena Naional, Bucharest. On 25 May 2012, Athletic also lost the Copa del Rey Final against Barcelona at the Vicente Caldern Stadium, falling 3-0. The 2012-13 season was a major disappointment for Athletic: the sale of key midfielder Javi Martnez to Bayern Munich, and with striker Fernando Llorente frozen out of the club over contract disagreements, led to Bilbao’s performances faltering. After finishing only in 12th place in La Liga, on 7 June 2013 Athletic’s president revealed that Bielsa would not be offered a new contract. After it expired on 30 June 2013, he left the club. Bielsa as a coach of Marseille in 2015. On 2 May 2014, Olympique de Marseille president Vincent Labrune announced the hiring of Bielsa as his team’s coach on a French radio station. Labrune had previously confirmed an agreement in principle had been reached after the club’s 0-0 Ligue 1 draw with Lille on 20 April. Bielsa signed a two-year contract set to begin after the 2014 World Cup, thus becoming the club’s first Argentine coach.He led them to the symbolic title of “autumn champions” after they beat Lille OSC on Matchday 19 (on 21 December 2014) of the 2014-15 Ligue 1 season before they faded to finish fourth in Ligue 1 at the end of the season. In October 2014, Marcelo Bielsa became well-known internationally when a Youtube clip emerged of him accidentally sitting on a cup of hot coffee in the middle of a game. He suffered no major injuries in relation to this incident which has so far had approximately 22k views. 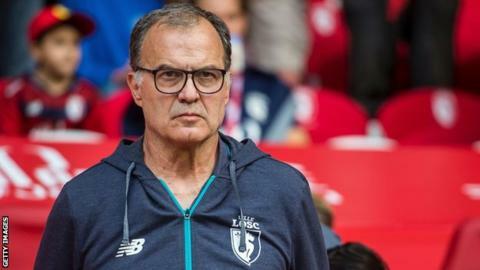 On 8 August 2015, after losing opening 2015-16 Ligue 1 match against Caen, Bielsa announced his resignation as the result of conflicts with the club’s management. On 6 July 2016, Bielsa was appointed manager of Italian Serie A club Lazio. However, just two days later, on 8 July, Bielsa quit as the club’s manager, prompting Lazio to issue legal action against Bielsa for breach of contract, suing him for 50 million. On 24 May 2017, Bielsa was unveiled as the new manager of Ligue 1 club Lille OSC. Bielsa’s signature formation in his squads – which he made famous and brought to the front of the world’s mainstream football scene during his coaching tenures in with the Argentina and Chile national teams, Athletic Bilbao and Marseille – is the 3-3-3-1 formation. For this formation, the players are: three defenders (one lbero with a stopper at each side), three midfielders (one central midfielder with two lateral-volantes at each side), three attacking midfielders (one enganche and two wingers at each side) and one centre-forward. The 3-3-3-1 allows great transitions from defending to attacking, as many of the players used in the formation can perform both defensive and attacking tasks. Moreover, it establishes superiority in numbers in every part of the field, since with this formation his teams could defend with seven players, attack with six or seven players, or protect a scoreline by overwhelming the midfield with 6 players. To use 3-3-3-1, all players have to quickly set to attacking positions when the ball is in the team’s possession, and all players have to aggressively press and recover the ball when it is not in possession, so it requires great teamwork and understanding between teammates. This signature style of Bielsa’s has had so much influence in the football scene that many present coaches – former players under Bielsa’s command – are heavily influenced by the style, such as Gerardo Martino, Mauricio Pochettino, Matas Almeyda and Marcelo Gallardo. Former Barcelona and Bayern Munich manager Pep Guardiola credited Bielsa as his tactical inspiration and called him the “best manager in the world” in 2012.Jorge Sampaoli, current manager of the Argentina National Team, former Sevilla FC manager from 2016-2017 and former Chile national team manager from 2012-2016, has been described as a “disciple” of Bielsa. Bielsa is known for watching and collecting numerous football videos to the point of obsession. He edits and analyzes each video for each individual player. He also utilizes statistical software and other technological tools to prepare for games. John Carlin, an English journalist, has stated that Bielsa has “the most learned football library on the planet”. Bielsa likes to systematise the game. He says that there are 29 distinct formations in football and believes that every young player should be given the opportunity to experience each of them. Lazio 6 July 2016 8 July 2016 50000000000000000000 50000000000000000000 50000000000000000000 50000000000000000000 !